Generally, we look up for the required information in a large dataset using INDEX, MATCH functions and return the matching value based on given criteria. But if we want to look up a value and return the cell reference or the cell address of resulting value then we need to use the CELL function. 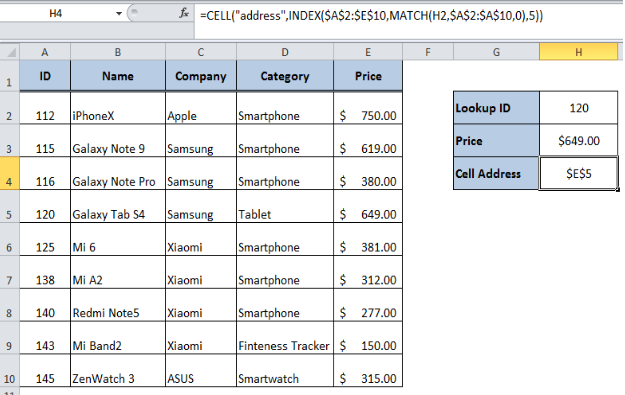 In this article, we will learn how to lookup for a value and get the address of lookup result using the CELL function. The CELL function gives information about a specific cell in a worksheet. That information can either be things like address and filename or even much more detailed, such as cell formatting, etc. address (required): This is the type of information that you are returning about the reference. Now, we want to get the address of lookup result of price as mentioned in cell H3. In order to do that we will wrap the INDEX, MATCH formula in CELL function using “address” option in cell H4 in the following formula. The INDEX function returns the reference of lookup result of price in range A2: E10 based on row and column number. The MATCH function returns the relative position (row number) for lookup ID 120 in range A2: A10. Since the price is listed in the 5th column of range A2: E10, we need to mention the column_num argument as 5. 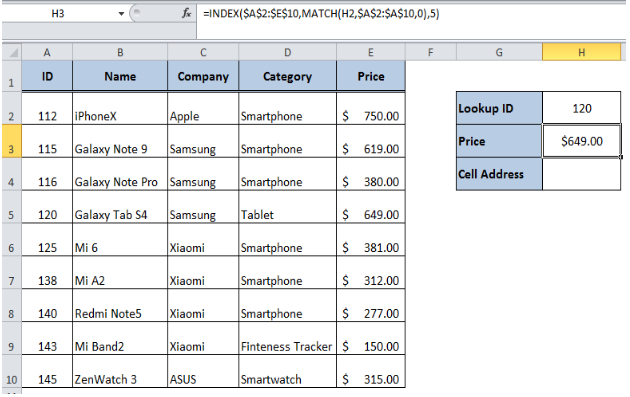 When we wrap the INDEX, MATCH functions inside the CELL function with “address” option it returns the cell address of lookup result of price in cell H4. It means that lookup result is present in $E$5 as per this example.